It could have been worse, said Klaus-Dieter Frankenberger in the Frankfurter Allgemeine Zeitung (Germany). 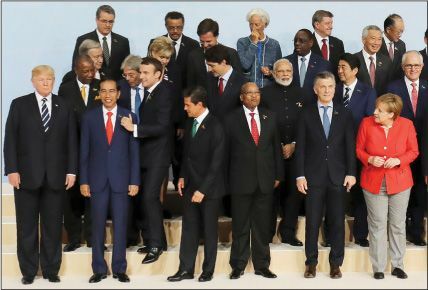 Trump didn’t storm out of any meetings in a fit of pique, and the G-20 managed to issue a final statement that upheld free trade, albeit with a caveat about the importance of national interests. Sure, Trump may be naïve in his approach to Putin, but probably no more so than was George W. Bush, who claimed to have a rapport with the Russian president. At least Trump got Putin to agree to “a partial armistice” in Syria. At this point, the world’s expectations of Trump are low. Europe has resigned itself to looking to German Chancellor Angela Merkel for reliable leadership. Trump himself considered his visit a success, said Marc Pitzke in Der Spiegel (Germany). His take can be summed up by that ridiculous video he tweeted, a mashup of “theatrical, content-free scenes and gestures” showing him with other world leaders. It was a bit of propaganda “aimed only at his nationalistic, conservative base.” They don’t know or care that Trump is making the U.S. isolated, shunned, and even pitied.